White,”and Who Are Jews of Color? “My whole life has been one of constantly explaining who I am and why I am because I was never allowed to be just a Jew, the way Jews who aren’t black are,” Manasseh continued. ​Nylah Burton calls light-skinned Jews “functionally white” and tells them to stop saying they’re “white-passing.” Jewbook erupts with racism. She recounted how some light-skinned Jews took offense to the phrase “white Jew” after Alma published a roundtable discussion that explored the mistaken beliefs and microaggressions that Jews of Color encounter in Jewish spaces: questions such as “Oh when did your family convert?”, “Were you adopted?”, or “You’re not REALLY Jewish though, right?” One black rabbi, for example, told the Jewish Telegraphic Agency (JTA) that she is sometimes mistaken for a member of her synagogue’s janitorial staff. In an article she wrote for Alma in June, Burton referred to Jewbook, the collection of Facebook groups managed predominantly for and by American Jews with a following in the thousands, as “a whole team of brothers and sisters” — the place where being black didn’t “make me feel like an intruder, or worse, like I’m invisible.” Yet, following the publication of “White Jews: Stop Calling Yourselves ‘White-Passing,’” disparaging and discriminatory comments engendered her and two other targeted Jews of Color, reported The Forward, to emancipate themselves from this virtual family and depart from Jewbook. (Burton noted, however, that, despite this racist backlash, many who engaged with her article did so respectfully.) In solidarity, approximately one dozen administrators have temporarily archived their online communities, thereby halting posting and commenting until they can approve a pledge to counter racism on Jewbook. “I would never — could never — delete my Facebook account in protest,” Burton declared in the aforementioned June article. “I love being Jewish too much.” Yet Burton told The Forward that she is disturbed by the toxic reaction to her article and what it represents: “racism in the real-life Jewish world,” as American journalist Ari Feldman specified. “I am losing faith,” she admitted. ​What is a Jew of Color? Ask someone in the United States to name a famous Jew. Far likelier than not, they will select one of European descent: perhaps Ruth Bader Ginsburg or Adam Sandler. They will choose an Ashkenazi Jew. Ashkenazi Jews, categorizes Encyclopaedia Britannica, are the descendants of Jews who, following the Crusades, migrated into Eastern Europe from northern France and western Germany. Today, over 10 million Ashkenazi Jews, according to a 2014 study in Nature Communications, derive from a population of about 350 from the Middle Ages and compose more than three-quarters of the worldwide Jewish population. It follows that Ashkenazi Jews, as MyJewishLearning.com describes, constitute “the Jewish identity most readily recognized by North Americans — the culture of matzah balls, black-hatted Hasidim and Yiddish,” in contrast with the far fewer and less genetically analyzed Sephardic Jews (the progenies of Jews from the Iberian Peninsula who, due to persecution and expulsion, escaped originally to Northern Africa and other parts of the Ottoman Empire) and Mizrahi Jews (whose ancestors resided in Northern Africa, the Middle East, and parts of the Caucasus; some relocated to India, China, and elsewhere in Central Asia), as characterized by Encyclopaedia Britannica. But there are also Jews of Color, many of whom seem to transcend these conventional classifications. 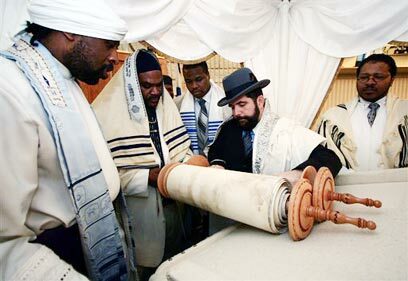 Brandeis University’s Steinhardt Social Research Institute found that 11 percent of Jews in the United States are ones of Color, who, the Religious Action Center of Reform Judaism (RAC) explains, “may identify as Black, Latino/a, Asian-American or of mixed heritage such as biracial or multi-racial” and “whose family origins are originally in African, Asian or Latin-American countries.” The Union for Reform Judaism (URJ) claims that this percentage nearly doubles when Sephardic and Mizrahi Jews are taken into account, but not all Jews of Color label themselves as such. Addison, who decided to change his Facebook name to his Hebrew one after his mother was threatened in an online comment, told Brown Eyez Publishing Company that someone on Jewbook once searched through his profile and told him that his admission to Hopkins was attributable solely to affirmative action. He was, consequently, not entirely surprised by the racism that erupted throughout Jewbook; he has seen and sustained it before. Addison expressed his lost senses of camaraderie and security. “This stuff has real-world consequences. These people are stealthy and malicious, and even if they’re not, they’re definitely encountering black people in their daily lives, with this racist mindset,” he said. One objection was raised by a commenter who wrote, “You’re insisting that you have a right to brand other Jews with a racial identity. In that, you mirror David Duke.” (Duke, a former Grand Wizard of the Ku Klux Klan, has vehemently denied the notion that Jews are white.) Some might say that American attorney Micha Danzig, who has served in the Israeli Army, echoed a less anti-Semitic version of this sentiment in his Forward response to Burton’s article. He conceded that some Ashkenazi Jews, “for approximately the last half century of American history, have enjoyed the privileges associated with passing for white,” but maintained that “300 years of American history does not define either race or identity, and it certainly doesn’t define Jewish identity.” He also specified examples in which Jews fell victim to discrimination in the United States, where Ashkenazi Jews “had long been classified as ‘Asiatics,’” and questioned when Ashkenazi Jews became white in America. Larisa Klebe, the Associate Director of Programs and Education at the Jewish Women’s Archive, and also a white American Jew, authored her own Forward interpretation of the debate. She articulated the difficulty for light-skinned Jews “to acknowledge that we benefit from white privilege while also contending with a long history of Jewish oppression,” but prescribed the hard pill to swallow: “some Jews are white.” Although she acknowledged the existence of anti-Semitism in the United States, she distinguished between discrimination and racism; white Jews do not experience the latter. ​There is racism against Jews of Color in the Jewish community. This year, the Israeli government has rejected thousands of African migrants and refugees. Sephardic and Mizrahi Jews have, historically, endured prejudice in Israel. After Israel won its War of Independence, many Mizrahi Jews migrated there and, by the 1970s, comprised half of the country’s population, yet faced institutional discrimination, chronicled The New York Jewish Week. In response, several formed the Black Panthers, who sought to achieve social justice for Sephardic and Mizrahi Jews. The irony is that the alt-right, who profess that Jews manipulate the news media to their advantage, are able to benefit from the Orthodox community’s endorsement of their hate speech. And, with this in mind, the controversial term “white-passing” takes on a whole new meaning. What is the global history of some Jews of Color? There are dozens of examples of Jewish communities in Sub-Saharan Africa and South, East, and Central Asia listed on the Wikipedia page “Jewish ethnic divisions,” and extensive Wikipedia pages on the history of Jews in China and India. The Cochin Jews are a group that first settled the Malabar Coast of India, according to local legend, as narrated by American anthropologist David G. Mandelbaum, as early as 70 CE following the Roman Empire’s Siege of Jerusalem. Kaifeng, one of the Eight Ancient Capitals of China, was, says New York Times, a “cosmopolitan center on a branch of the Silk Road” from the 10th to the 12th century. Although scholars still disagree about when they first arrived, Sephardic Jews, either hailing from “Persia and India as traders” or “fleeing the Crusades,” built a community in Kaifeng; traces of this once prosperous community remain today in their 50 descendants. In 2011 the Israeli Central Bureau of Statistics tallied over 125,000 citizens with Ethiopian heritage, who originate from the tens of thousands of immigrants of the Beta Israel — House of Israel — that made the exodus from “drought- and war-struck Ethiopia” to Israel in several waves during the late 20th century, alleging descent from the Queen of Sheba and the legendary King Solomon, notes Encyclopaedia Britannica. Kiara Timo-Vaughn is a Lead Intern with Brown Eyez Co.